Leftover chicken can be sauteed with mushrooms, sprouts, onion and of course eggs! 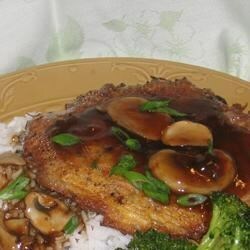 The accompanying sauce is simple and flavorful." Dovetailing Tip: Use the ground chicken cooked on Day 4, and the leftover vegetables from Day 3 to make this quick and easy recipe. Beat eggs in a large bowl. Add the celery, onion, bean sprouts, mushrooms, chicken, salt and pepper. Mix together. Heat oil in a medium skillet or wok and brown egg mixture 1/2 cup at a time. When all of the mixture is browned, set aside. To Make Sauce: Heat the chicken broth in a small saucepan until simmering; add sugar and soy sauce and blend well over medium heat. Add cold water and cornstarch and stir until thick and smooth. Serve over Egg Foo Yung.